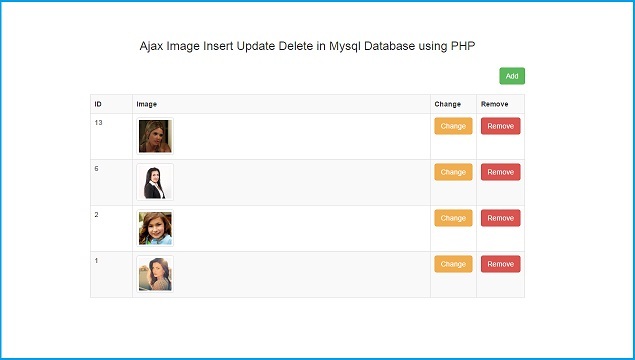 In this blog we have made discussion on how to store and display image into Mysql database with change or edit mysql database image and remove or delete images from Mysql Database by using PHP script with Ajax. In one of my previous post we have already seen How to Insert and Fetch Image from Mysql Database by using pure PHP Script. But in this post we have not only store and retrieve image from Mysql Database but also update and delete images from Mysql Database by Ajax Jquery with PHP script without refresh of webpage. If you have developed any web application and if you have looking for web tutorial on How to store images in Mysql Database by using PHP script then you can follow this tutorial in which we have store and retrieve image from database by using PHP script with Ajax Jquery. In many of the project required this type of feature in which images want be stored in database then there is one big question how can we store images in to Mysql database. In Mysql Database there is four data types are available for store images into Database. There is data type are Tiny blob, Blob, Medium Blob and Long Blog. Here Tiny Blob and Blob data type are used for store small size images, for medium size image we can use Medium Blob datatype and for store large size images we can use Long Blob datatype. So These data type are used to store images into Mysql Database. Now question is in which type of project we can store images into Database, if you have developed any eCommerce site and we want to index site page on search engine then this type of website we have to follows to images in particular folder according to keyword name. Because images will also index on search engine also, but this type of images will not directly index on search engine. But if you have developed any enterprise level application then you have can store images into database because we can easily retrieve from database. So, in this post we have describe How to insert update delete and fetch images from database by using PHP with Ajax Jquery. Thanks, I don't know much about ajax, but your example is really simple and easy. It helped me lots. Can you provide any tutorial for "imaje upload using react and php pdo with json"